Imagine a garden with containers filled with a variety of colorful flowers, herbs, ornamental grasses, succulents and even vegetables. Wouldn’t you love to have pots that look like this, overflowing with beautiful plants? But, what if you live in the desert? Can you grow plants in pots that aren’t just beautiful but that can thrive in our hot, dry climate? Believe it or not, you can. 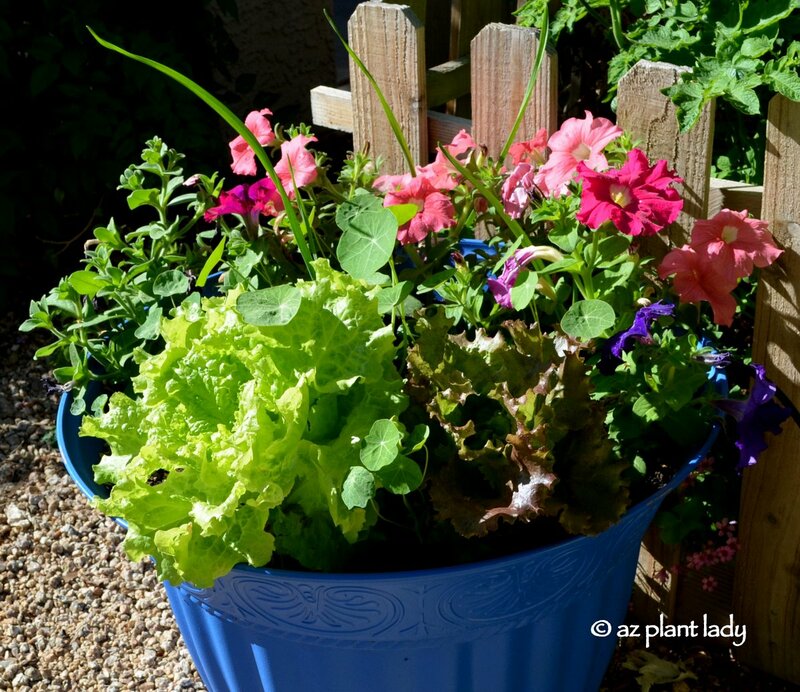 Whether your container garden is limited to one pot or several – you can grow plants in pots in the desert garden. Now before you say, “I’ve got a black thumb…everything I plant in pots die”, I have a great resource for you. “Getting Potted In The Desert” is a wonderful resource that shows you step-by-step instructions on how to create beautiful potted gardens that will thrive in our desert climate. While you can find other books that offer helpful advice on how to create potted gardens, “Getting Potted In The Desert” speaks specifically to those of us who live and garden in the desert Southwest where our hot, dry summers bring about special challenges. Beyond the helpful advice on selecting containers and the right location, the book also talks about plant choices including flowering annuals, perennials, grasses, herbs, succulents and vegetables. Clear and easy to understand guidelines are given on how to water, fertilize and how to adjust to changing weather conditions including freezing temperatures. What’s even better, the guidelines are broken up into monthly guides, making growing plants in pots, easy. Lists of plants that do well in the desert container garden are also given along with lovely photographs of pots filled with plants, which will inspire you. 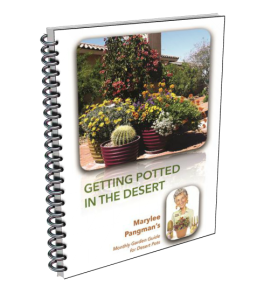 The author, Marylee Pangman, has over 20 years of experience growing potted plants in the desert. In fact, she is a certified Master Gardener and had her own company, “The Contained Gardener”, where she designed and maintained container gardens for clients. In addition, she has taught numerous classes on growing potted gardens that can withstand hot summers and desert winters. As a horticulturist who has planted and maintained container gardens over the years, I can tell you that Marylee’s book is a godsend for those who love container gardening and need practical guidance. Marylee has graciously offered to send a free copy of “Getting Potted in the Desert” to the winner of this giveaway. 1. To enter, simply leave me a comment about what plant you would like to grow in pots or what you like about container gardening. Let your friends know about this great giveaway and I will pick a random winner on October 5th. *I was provided with a free copy of this book for my honest review. https://www.azplantlady.com/wp-content/uploads/2015/09/colorful_containers_penstemon_Sedona_garden.jpg 640 613 arizonaplantlady@gmail.com http://www.azplantlady.com/wp-content/uploads/2018/10/favicon.png arizonaplantlady@gmail.com2015-09-28 13:30:002016-10-26 14:35:32Container Gardening Book Review & Giveaway: "Getting Potted In The Desert"
with some high elevation succulents. (Actually, everything is an experiment up here! 🙂 I have quite a few containers as well. They are my favorites. We'll see how they winter. My hens and chicks winter perfectly. Gardening here is bit tricky because of the extremes. Your flowers are beautiful!! WOW! The book looks wonderful. Unless they is a section for high desert gardening, it probably wouldn't suit for me. Thank you for sharing your wonderful tips and photos. I live in the High Deserts of California. The weather is very extreme. It's very challenging to grow some of my favorite plants. Growing plants in pots allow me to grow things that would not survive during the cold winter, at the same time, potted plants can be very challenging to maintain. What I like most about growing plants in pot is it allows me to create miniature themes. I used to grow a lot of plants in containers in Kansas but here in Southern California it's a whole different ballgame. I like growing in pots because it's easier – don't have to get down on hands and knees, no having to deal with poor soils or tree roots and rocks, can move if sunlight isn't optimal. Pots add color and interest as well. I'd really like to get some lavender to grow in pots. I enjoy following you on Facebook. I love container gardening — it's perfect for my ever-changing succulent collection. I'm learning to add salvias, penstemon and others to the mix. Just visited your excellent Twitter feed, and am now following! Thanks so much for this blog! With all of the beautiful colors of pots, variety of sizes and shapes, container gardening is the perfect way to dress up a bland looking patio. .For those of us with small or no yards it's an opportunity to still indulge our love for gardening. I don't plant a single type of plant. I mix herbs with colorful,flowering plans and spikey greenery.. I also found instructions for turning a large pot into a base for an umbrella. Then potting flowers in the pot around the PVC pipe in the center where the umbrella pole is inserted. Concrete is put in the bottom of the pot with drainage holes. It anchors the umbrella andb makes a unique and beautiful addition to an outdoor patio. Sorry I do not have Twitter, Facebook or any other social networks but I do love your column. I'd like to plant lettuce! And I already follow you on FB. I love planting in pots, all winter, here in Gilbert, AZ. I love both multi-color flower filled pots, with a mix of heights, and solids, of one type and color. However, once it gets really hot, in June, I give up. I yank everything, and just survive the summer, like all those poor plants in the ground! I would love to learn anything and everything else about container gardening in the desert. 10 years here, and I am learning, still. Thanks you! I would love to be the winner of the, Getting Potted in the Desert. The areas where I had gardens before are now, after 12 years in the house are, too shaded. The only sun is on patios and the container idea would be great. I would be interested in planting colorful flowers , herbs and cactus. I like to plant in pots species that can be invasive or too robust, and need containment. Like ruellia, primrose, sphagnicola. Also the agaves that pup excessively, americana, angustifolio. Also plants that just can't quite make it through summer or winter in the ground here. Sedums, adeniums, aeoniums, echeveria, sempervivums. I'm even potting a Meyer lemon in order to minimize it's future size without pruning deeply. 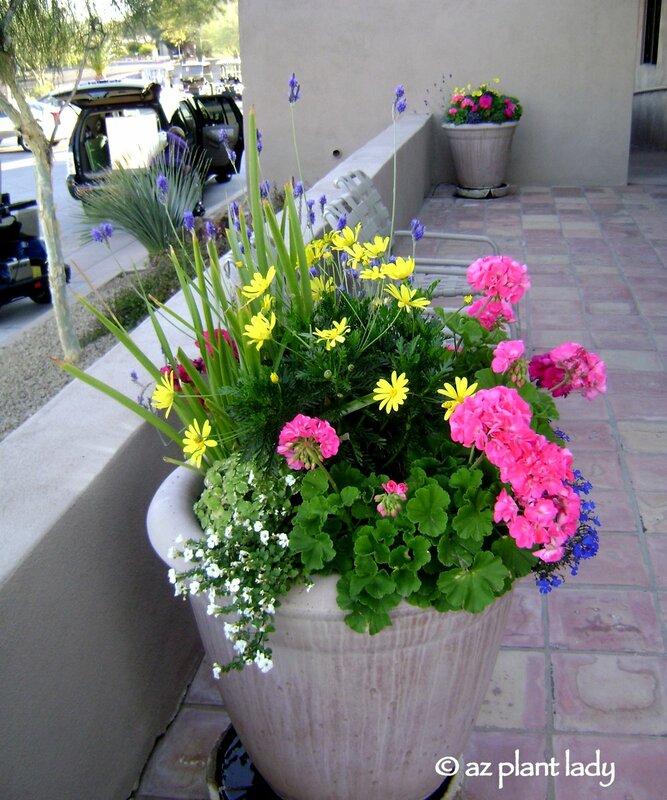 I like planting in pots because it's a way to add more color in the desert garden, using colorful pots, that is. I love container gardening because I can move them around and into shade as the sun gets too intense during the summer in my zone 9A garden. I would grow vegetables (lots of tomatoes and peppers) and herbs. Great post – thank you! The container book looks wonderful. I work at ACE hardware, where we have a sweet garden center and happen to carry some garden bag, too. Very cool to see all the new offerings in the marketplace, including bags for composting. That has seemed overwhelming to me, until now, but the bags give me hope : ) I am a new gardener, as well as a first time homeowner with an undeveloped yard that is mostly rocks and not graded properly. What I love about container gardening is that I can start to plant color and even vegetables and herbs in the meantime, because I'm not quite sure how to proceed with the yard. I have several containers and have tried with some success: hibiscus, verbena, dusty miller, gazania, sweet potato vine, lantana, coleus. My next project is to plant veggies and in fact am heading to the library for a talk on fall veggie gardening this afternoon! Looking forward to following your blogs and FB posts. Thanks again, from Oro Valley, AZ. I'm interested in adding pots of color for winter. Probably annuals will do the trick but I like to grow "new to me" plants with color for my patio. Love, love your blog. Since moving from the midwest to Phx 5 years ago, it's been a lifesaver. You helped me design my landscape and plant all by myself. (errr…with my (somewhat willing) three sons and (because he has to) husband. Thanks for what you do! 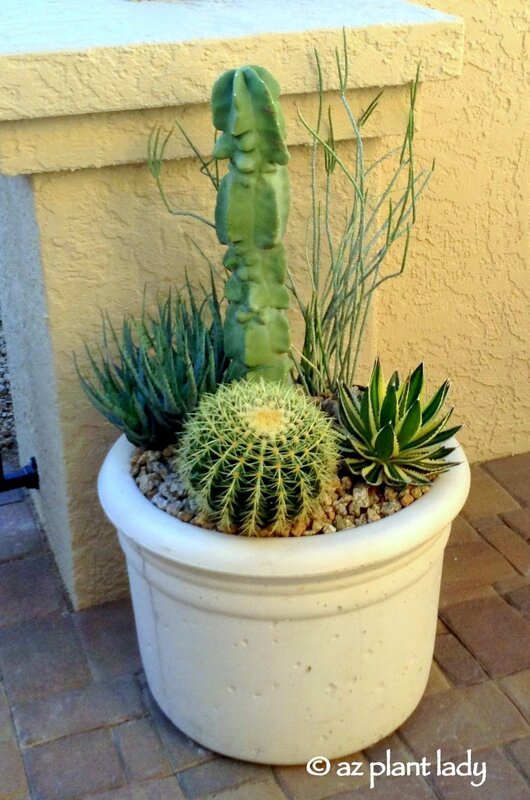 Oops … did not answer the ?…I love container gardening and love succulents and cacti the most. Probably b/c they are EASY!